Will the Real George W. Please Stand Up? National Portrait Gallery, Smithsonian Institution. Acquired as a gift to the nation through the generosity of the Donald W. Reynolds Foundation. On February 15, 2002, the National Portrait Gallery’s iconic image of the father of our country began a national tour at the Museum of Fine Arts in Houston, Texas. For the first time in history, this prized image—the life-sized portrait of George Washington by artist Gilbert Stuart—has gone on the road. An artifact whose historical and cultural significance has been compared to that of the Liberty Bell and the Declaration of Independence, the painting is one of the most important visual documents of the founding of our nation. Senator and Mrs. William Bingham of Philadelphia commissioned the portrait from Stuart in 1796 as a gift for the British Marquis of Lansdowne, who sympathized with colonial grievances before the Revolutionary War. 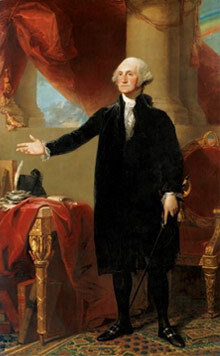 Thus the painting is often referred to as the "Lansdowne" portrait to differentiate it from Stuart's other images of Washington. For more than 200 years, the painting remained in private hands; it was incorporated into the collection of the 5th Earl of Rosebery in the 1880s. It later hung in a castle in Scotland. In 1968 the Lansdowne portrait was loaned to the National Portrait Gallery in Washington, D.C., where it served as the cornerstone of the museum's opening exhibition. For thirty-two years, it graced the Gallery's rotunda, greeting visitors as they ascended the building's grand staircase to the second floor. But in the fall of 2000, its British owner notified the Gallery of his decision to sell it at auction if the Gallery could not meet his asking price of $20 million. The search for a benefactor to the Galleryand to the nationbegan. In March 2001, a $30 million gift from the Donald W. Reynolds Foundation of Las Vegas, Nevada, assured that the painting would remain in the United States. Of that amount, $20 million went to purchase the painting, $4 million to renovate a gallery space dedicated exclusively to the portrait, and $6 million to ensure that the portrait would be shared with the American people. After the exhibition closes in Houston, it continues to seven other cities, concluding with the portrait's return to its permanent home in the National Portrait Gallery. Originally, the portrait hung in Lord Lansdowne's London house on Berkeley Square, accompanied by other artworks, including a sculpture of the Roman general Cincinnatus, with whom Washington is often compared. Reportedly, Cincinnatus left his plow to save the Roman republic, then relinquished his public role and returned to private life. The parallel between Cincinnatus and Washington as men of service is striking. This "man of service" is the George Washington that the Donald W. Reynolds Foundation wanted America to see. Here was a man who served as commander in chief of the Continental army, who shaped the American presidency, who guided the country through the "fragile experiment" of democracy. Certainly others had greater intellect and were better educated, more articulate, and of calmer disposition. But Washington was chosen. Unanimously elected to the presidency, he served two terms and then retired from office. Here was a man who refused to be king. Join the tour at one of its remaining six locations as the National Portrait Gallery explores this man of character, self-sacrifice, and patriotism. Or follow the tour online, through our web site. George Washington is anxious to meet you.